After leading by five points overnight, a European fighback forced Paul McGinley’s men to dig deep. The victorious Great Britain & Ireland team. HEADING INTO THE final day of the Vivendi Seve Trophy at Saint-Nom-La-Bretèche, Continental Europe’s cause looked to be well and truly lost. Five points adrift of Great Britain & Ireland with only the ten, final-day singles remaining, the prospect of securing a tie, let alone a victory, looked a remote one. Recognising that his side’s remaining hopes rested with a momentum-building fightback early on the final day, European captain Jean van de Velde front-loaded the match order with his strongest players. Thomas Bjorn led the charge against Lee Westwood, followed compatriot Anders Hansen, Francesco Molinari, Alexander Noren and Miguel Angel Jimenez, drawn to face Open Champion Darren Clarke. Hours later, when every one of those five players succeeded in bolstering the European cause with a full point, the Frenchman appeared to be on the verge of conjuring the most improbable of victories. The comparative weakness of his second order began to tell, however, when big-hitting Belgian Nicolas Colsaerts was held to a half-point against England’s David Horsey in the sixth match. That sudden shift in momentum inaugurated a brief, but crucial, spell of dominance from the British Isles team. A trio of one-hole victories from Scott Jamieson, Ian Poulter and Mark Foster, coming against Pablo Larrazábal, Matteo Manassero and Raphael Jacquelin, respectively, proved enough to put the trophy beyond Europe’s grasp. Rendered redundant by Foster’s final putt, the final match, between Peter Hanson and Ross Fisher, finished all-square, guaranteeing a final score of: Continental Europe 12.5 – 15.5 Great Britain & Ireland. Email “European fightback falls flat as GB&amp;I take Seve Trophy”. 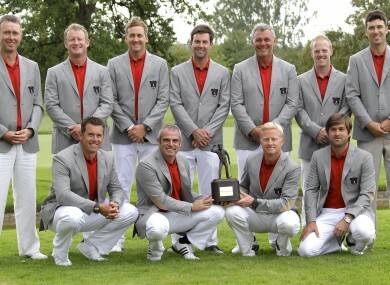 Feedback on “European fightback falls flat as GB&amp;I take Seve Trophy”.